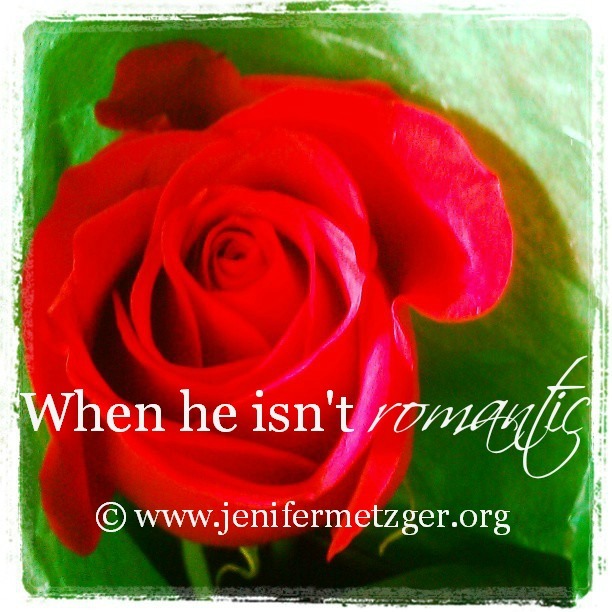 We all love romance and want our husbands to be romantic. At least be romantic once in a while. But the truth is not all men are always romantic. Some men are hardly ever romantic. And this hurts us. We need to first, understand that God made man and woman different. Most, though maybe not all, women like romance. Many men do not even know what romance really is. God made us different. Don't fault him on who God made him to be. See romance from his eyes. Maybe he doesn't bring you flowers, but he saved the last slice of pizza for you, turned the coffee pot on for you or texted you from work. That is his way of showing romance to you. It may look different than what you expect or want, but it's time to embrace your husband as he is. Instead of being hurt or complaining for the things he doesn't do, appreciate the things he does do. Thank him for every little thing. It may not be chocolate and roses, but it's his way. Remember that romance isn't a one way street. Husbands like when we do things for them too. Years ago I had been wanting a rose. My husband hadn't gotten me a rose in a while and I just really wanted one. Then while at the grocery store I walked by the floral department and saw beautiful red roses. For a moment I felt a pang of desire. Then it hit me. I can buy him a rose too! So I did. I bought him a beautiful red rose and placed it on our dresser with a note saying I love you for him to find when he came home from work. He was so surprised and really grateful! Next time you are offended or hurt because your husband hasn't been romantic, remember God made him the way he is, embrace it. What does your husband do that may not be the typical romantic stuff, but might be his way of being romantic? This is wonderful! I find that I am not the most romantic woman. My hubby...is very romantic. Sometimes I hurt just because I feel I should be more romantic!